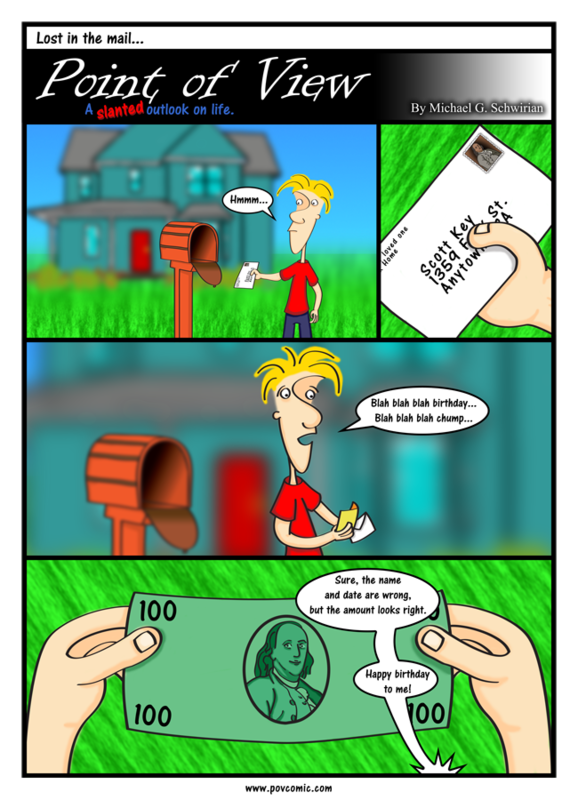 Today a good friend of mine, Scott Key, adds another hash mark to his age and to commemorate the event, I’ve created this comic dedicated to him. Looks like Scott didn’t fare so well thanks to Simon, but hey – it’s the thought that counts. Scott is instrumental in the production of POV Comic – He and my buddy Andrew proof each comic (except for this one) and act as a soundboard for my ideas. Scott has been a good friend for many years and I am glad to have him in my life. PS… Yesterday was my wife’s birthday… she didn’t get a comic. No.. because I gave her the $100 Simon stole from Scott. So was that Scott’s mom yelling at Simon?